Last December we were delighted to hand over a donation of £1500 to Col. McDonald of the Royal Engineers based at Carver Barracks. 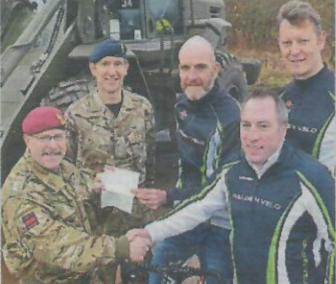 The donation was split between the Injured Soldiers' Fund and the Felix Fund, allowing us to contribute nationally and also to target those injured soldiers based out of Carver Barracks. This money was raised on the back of the clubs 101 and MSG event held last year. So a big thank you to everyone who helped out to make both events a success. Keep your diaries free for the 9th July when we'll once again be running a money raising sportive event, this time in conjunction with Round Tables Carnival. More details to come soon.